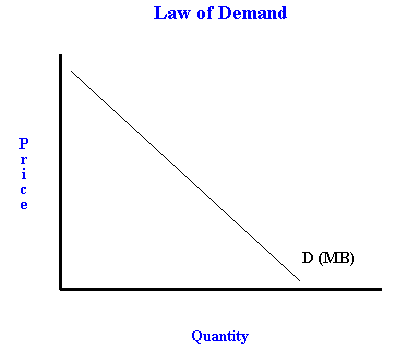 Law of Demand: What is it? Many viewers of political commentators will see the "experts" comment on prices of good or services falling or rising due to declined or increased demand. What does that mean? How does this impact prices? Basic Macro-Economic Theory states that the the price and the demand of that stated good has an inverse relationship: As the price of a good rises, the quantity demanded of that said good declines. Conversely, as the price lowers, the quantity demanded for that good rises. An example of this can be seen when a store has a popular good, that is on sale for 50% off. The store will see an increase in traffic, as more consumers will line up to purchase that good at a lower price. Conversely, if the store decided to raise the price 50% above the current price, consumers will not seek to purchase this item. This Law can be displayed graphically, as the graph will demonstrate a downward sloping line, going from left to right. It is negatively sloped, showing the inverse relationship between price and quantity demanded. Of course, this analysis is very simplistic, as there are much more deeper concerns with this particular law. One concern: Why is the function, or the line, negatively sloped? Why does it go downward from left to right? These concerns are addressed in the notion of Marginal Utility, as that will be discussed in a different blog post. Sales Tax: Who Pays for It? Taxation is an emotional issue with most Americans. A variety of solutions have been presented for debate (e.g. "Fair Tax", "Flat Tax", and the like). Some proponents of the Flat Tax have reasons to choose it over the sales tax ("Fair Tax"), or vice versa. Many writers discuss the notion of implementing a Sales Tax to solve the Income tax issue. Is this the case? Can it solve the taxation issue? Is a sales tax "better" than an income tax? Side Note: The purpose of this analysis is not to state which tax is better. The purpose of the analysis is to demonstrate who actually "pays" for the tax. Specifically to a Sales Tax, many experts believe that Sales Tax is more "optimal" or "better" than a Flat Income tax. These experts believe that the Sales tax can be "pushed" forward to the consumers, and the consumers can afford to pay the higher sales tax due to the fact that there is no income tax. This notion “pushing forward the tax” is risible. Consider this scenario: Suppose a young couple goes out on a date. The young man chooses a fine steak house for the date. The bill is presented to the couple, as the young man reviews the bill. Let us suppose the total drink/food portion of the bill was $100, and the sales tax charged was 25% or $25--leaving a grand total of $125 for the bill. The young man reaches into his wallet, and provides a form of payment to cover the bill. On the surface, it would seem that the young man is "paying" for the sales tax, as this is the position that is pushed forward by the experts. However, let us dig slightly deeper. After the steak house closes for the day, the Manager reviews the accounting reports for the day, as he/she sees the following: Total Sales $100, total sales tax $25. This tells us that the $25 must be paid to the taxing authority, so the steak house does not keep the $25. Utilizing economic supply and demand analysis, the sales price is the same as the equilibrium price, as in this case the total price paid by the consumer is $125. Both the consumer (the young man on the date), and the supplier(the Steakhouse) agree to the sales price of $125. Yet, upon closer inspection, the business owner does not keep the entire $125; the $25 dollars is paid towards the taxing authority. Thus, the business owner loses $25 of revenue that originally was collected from the customer. In short, the business owner pays for the sales tax. The business owner's lost opportunity cost, in this case the $25, is lost revenue that could have been utilized for other means: i.e. acquiring more labor, purchasing more equipment, and the like. This proves that even the sales tax impacts business owners, and it is ultimately a tax on the original factors of production: e.g. Land, Labor and Capital.